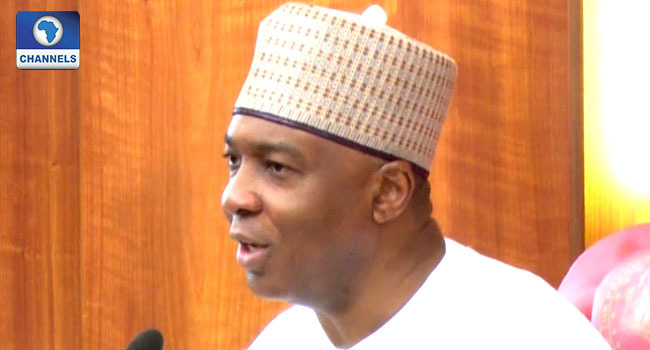 The Senate President, Bukola Saraki, has explained the reason for his defection from the All Progressives Congress (APC) to the Peoples Democratic Party (PDP). In a statement signed by him on Tuesday, the Senate President explained that he defected after extensive consultations and after efforts to ensure a harmonious existence in the APC proved futile. This is not a decision that I have made lightly. If anything at all, I have tarried for so long and did all that was humanly possible, even in the face of great provocation, ridicule and flagrant persecution, to give an opportunity for peace, reconciliation and harmonious existence. However, it is after an extensive consultation with all the important stakeholders that we have come to this difficult but inevitable decision to pitch our political tent elsewhere; where we could enjoy a greater sense of belonging and where the interests of the greatest number of our Nigerians would be best served. They have done everything to ensure that the basic rules of party administration, which should promote harmonious relations among the various elements within the party were blatantly disregarded. All governance principles which were required for a healthy functioning of the party and the government were deliberately violated or undermined. And all entreaties for justice, equity and fairness as basic preconditions for peace and unity, not only within the party, but also the country at large, were simply ignored, or employed as an additional pretext for further exclusion. The experience of my people and associates in the past three years is that they have suffered alienation and have been treated as outsiders in their own party. Thus, many have become disaffected and disenchanted. At the same time, opportunities to seek redress and correct these anomalies were deliberately blocked as a government-within-a-government had formed an impregnable wall and left in the cold, everyone else who was not recognized as “one of us”. This is why my people, like all self-respecting people, would do, decided to seek accommodation elsewhere. However, what we have seen is a situation whereby every dissent from the legislature was framed as an affront to the executive or as part of an agenda to undermine the government itself. The populist notion of anti-corruption became a ready weapon for silencing any form of dissent and for framing even principled objection as “corruption fighting back”. The persistent onslaught against the legislature and open incitement of the people against their own representatives became a default argument in defence of any short-coming of the government in a manner that betrays all too easily, a certain contempt for the Constitution itself or even the democracy that it is meant to serve. The emergence of new national party executives a few weeks ago held out some hopes, however slender. The new party chairman has swung into action and did his best alongside some of the Governors of APC and His Excellency, the Vice President. I thank them for all their great efforts to save the day and achieve reconciliation. Even though I thought these efforts were coming late in the day but seeing the genuine commitment of these gentlemen, I began to think that perhaps it was still possible to reconsider the situation. When we left the PDP to join the then-nascent coalition of All Progressives Congress (APC) in 2014, we left in a quest for justice, equity and inclusion; the fundamental principles on which the PDP was originally built but which it had deviated from. We were attracted to the APC by its promise of change. We fought hard along with others and defeated the PDP. In retrospect, it is now evident that the PDP has learnt more from its defeat than the APC has learnt from its victory. The PDP that we return to is now a party that has learnt its lessons the hard way and have realized that no member of the party should be taken for granted; a party that has realized that inclusion, justice and equity are basic preconditions for peace; a party that has realized that never again can the people of Nigeria be taken for granted. What the experience of the last three years has taught us is that the most important task that we face as a country is how to reunite our people. Never before had so many people in so many parts of our country felt so alienated from their Nigerianness. Therefore, we understand that the greatest task before us is to reunite the county and give everyone a sense of belonging regardless of region or religion. Every Nigerian must have an instinctive confidence that he or she will be treated with justice and equity in any part of the country regardless of the language they speak or how they worship God. This is the great task that trumps all. Unless we are able to achieve this, all other claims to progress, no matter how defined, would remain unsustainable.